The new edition of the worldwide bestseller The Ultimate Business Library is a one stop guide to the world's leading management thinkers. 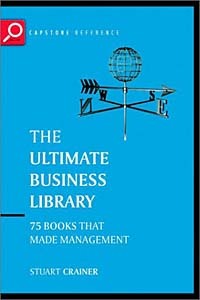 It offers a unique summary of over 75 business books that have had the most impact on business thinking. From Tom Peters to Peter Drucker and Rosabeth Moss Kanter to Charles Handy, The Ultimate Business Library will ensure business men and women are rapidly up to speed with the ideas shaping modern business. Изд-во Capstone Pub. 2002 г.